(Nanowerk News) Down at the nanoscale, where objects span just billionths of a meter, the size and shape of a material can often have surprising and powerful electronic and optical effects. Building larger materials that retain subtle nanoscale features is an ongoing challenge that shapes countless emerging technologies. Now, scientists at the U.S. Department of Energy's Brookhaven National Laboratory have developed a new technique to rapidly create nano-structured grids for functional materials with unprecedented versatility. "We can fabricate multi-layer grids composed of different materials in virtually any geometric configuration," said study coauthor and Brookhaven Lab scientist Kevin Yager. "By quickly and independently controlling the nanoscale structure and the composition, we can tailor the performance of these materials. Crucially, the process can be easily adapted for large-scale applications." The results – published online June 23 in the journal Nature Communications ("Arbitrary lattice symmetries via block copolymer nanomeshes") – could transform the manufacture of high-tech coatings for anti-reflective surfaces, improved solar cells, and touchscreen electronics. The scientists synthesized the materials at Brookhaven Lab's Center for Functional Nanomaterials (CFN) and characterized the nanoscale architectures using electron microscopy at CFN and x-ray scattering at the National Synchrotron Light Source—both DOE Office of Science User Facilities. "Self-assembled structures tend to automatically follow molecular preferences, making custom architectures challenging," said lead author Pawel Majewski, a postdoctoral researcher at Brookhaven. "Our laser technique forces the materials to assemble in a particular way. We can then build structures layer-by-layer, constructing lattices composed of squares, rhombuses, triangles, and other shapes." To further exploit the power and precision of LZA, the researchers applied a heat-sensitive elastic coating on top of the unassembled polymer film. 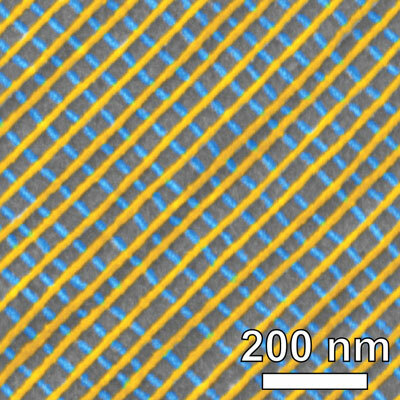 The sweeping laser's heat causes the elastic layer to expand—like shrink-wrap in reverse—which pulls and aligns the rapidly forming nanoscale cylinders. "The end result is that in less than one second, we can create highly aligned batches of nano-cylinders," said study coauthor Charles Black, who leads the Electronic Nanomaterials group at CFN. "This order persists over macroscopic areas and would be difficult to achieve with any other method." 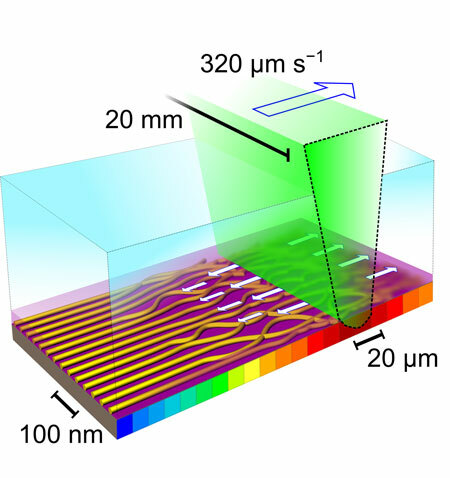 "The direction of the laser sweeping across each unassembled layer determines the orientation of the nano-wire rows," Yager said. "We shift that laser direction on each layer, and the way the rows intersect and overlap shapes the grid. We then apply the functional materials after each layer forms. It's an exceptionally fast and simple way to produce such precise configurations." Study coauthor Atikur Rahman, a CFN postdoctoral researcher, added, "We can stack metals on insulators, too, embedding different functional properties and interactions within one lattice structure. "The size and the composition of the mesh make a huge difference," Rahman continued. "For example, a single layer of platinum nano-wires conducts electricity in only one direction, but a two-layer mesh conducts uniformly in all directions." 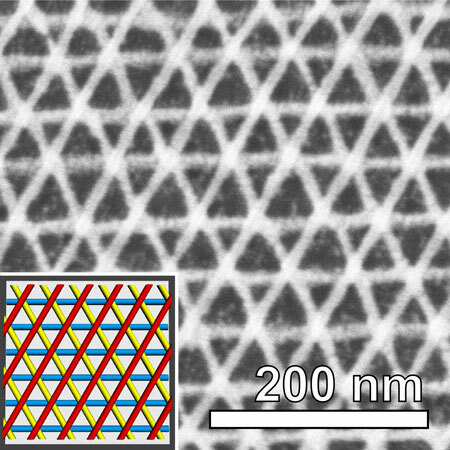 "We can generate nearly any two-dimensional lattice shape, and thus have a lot of freedom in fabricating multi-component nanostructures," Yager said. "It's hard to anticipate all the technologies this rapid and versatile technique will allow."